It has been a very long time since I last wrote something for Children of the Blazing Fist, for which I am entirely to blame. Sorry if anyone missed me. 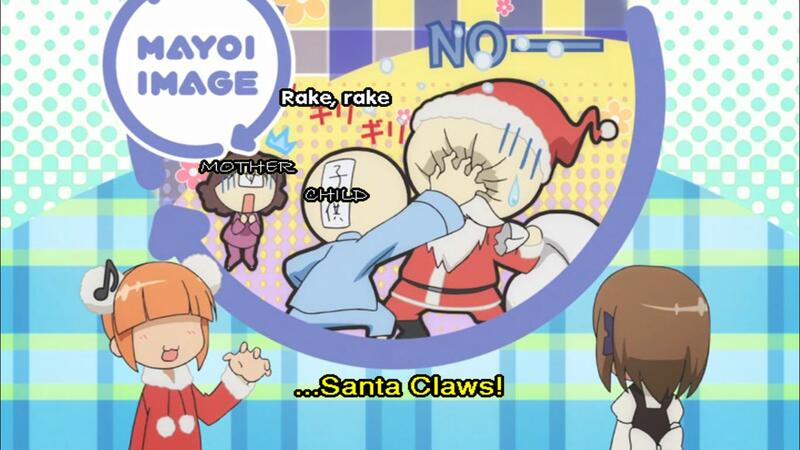 As it has been a while, I think it is high time I reviewed another anime. This time I set my eyes upon a belated Christmas gift from fellow writer Franklin Raines, a replacement gift from the set of special Monster Hunter Kanji figures I wanted. But backorders, man, backorders. Seeing as March was already here and with no sign of the figures, he decided to gift me a show I was actually interested in owning: Place to Place, a romantic comedy (of sorts, I’ll go into more detail about that later) which I’m pretty sure almost no one reading knows of, so I’m sure that’ll please Franklin’s obscure requirement. 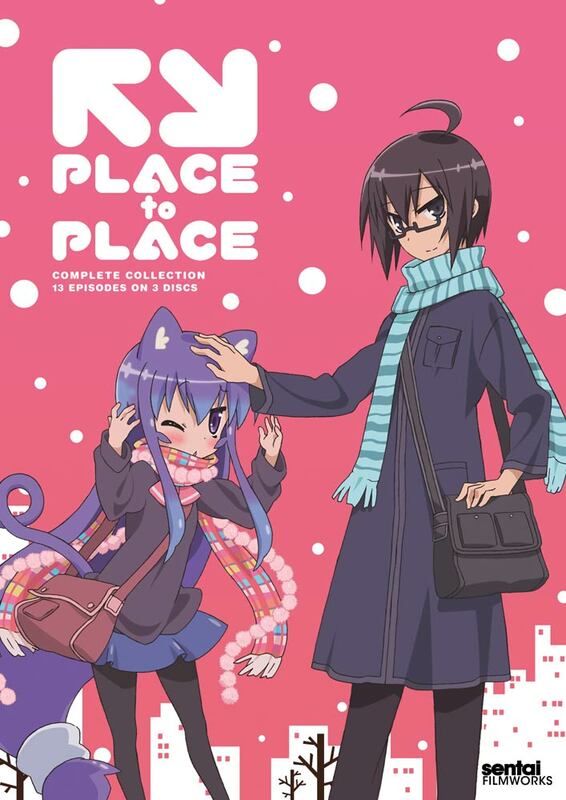 Place to Place is an anime released in 2012 based on a 2006 4-koma (pronounced yonkoma, for those who care to know) manga called Acchi Kocchi (literally, Place to Place) by Ishiki, which seems to be his first work as a mangaka. The anime was directed by Fumisoki Oitashi, who has also worked on Astarotte’s Toy (and its OVA), as well as Romeo X Juliet. Tsumiki Miniwa is a diminutive student at Nekoge High school with a not so diminutive mane of hair and a very stoic attitude. Tsumiki has a crush on her friend Io Otonashi, who’s as cool as a cucumber, fairly popular with girls, and an unintentional smooth-talker. Tsumiki continually tries to convey her feelings to Io but in a typical dishonest fashion, as she is constantly trying (poorly) to play things cool or denying any interest in him. Will these two ever even get together? If you were to take a look at the back of Sentai’s DVD case, or my synopsis of Place to Place up to this point, you would think you got a romantic comedy in your hands, and a sappy one at that. Okay, okay, that’s pretty cute. I admit this that this is a romantic comedy, to an extent, but that would not be completely accurate. At the very beginning of the story, we are introduced to three characters that make this story slightly different than others of its genre. Mayoi Katase, a gadgetry genius and resident troll who constantly teases Tsumiki on her crush on Io. Sakaki Inui, Io’s rival and best friend whose only real shortcomings compared to his friend are his penchant for mischief and lesser popularity, he tends to get beat up a lot, along with Mayoi, as they team up quite often to cause trouble. And finally Hime Haruno, the most normal of the group, save for her ditzy behavior and constant nosebleeds whenever she spies something cute. A cast of goofy secondary characters designed to make this about as lighthearted as it could possibly be. 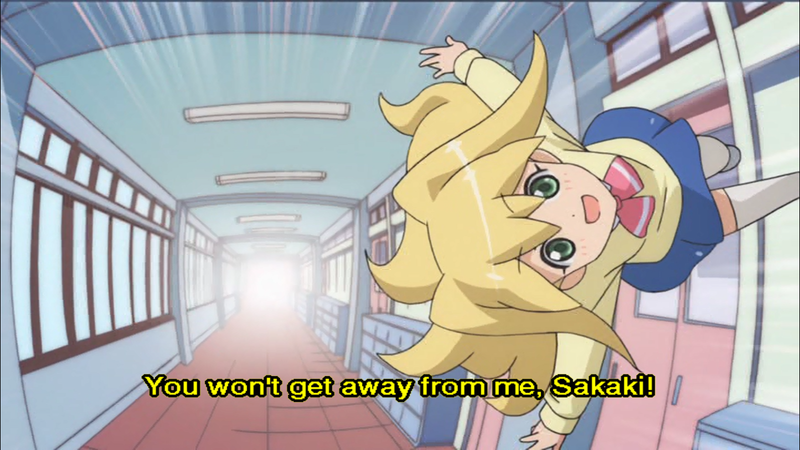 The cast is occasionally joined by a group of friends from their class including Kana Miyama, a girl about as short as Tsumiki, but with enough cheer to tire out a six-year old, sturdy enough to smash through walls, and air-headed enough to think spraying onion juice on someone’s eye won’t hurt, Saki Sakimori, a girl who loves teasing people in general, and trolling Kyouya Saibara for her own amusement, and Kyouya himself, while the most ordinary-looking of the boys, he has athletic ability to match Io and Sakaki, but gets even less respect than Sakaki whenever he’s around. This makes just as much sense in context. 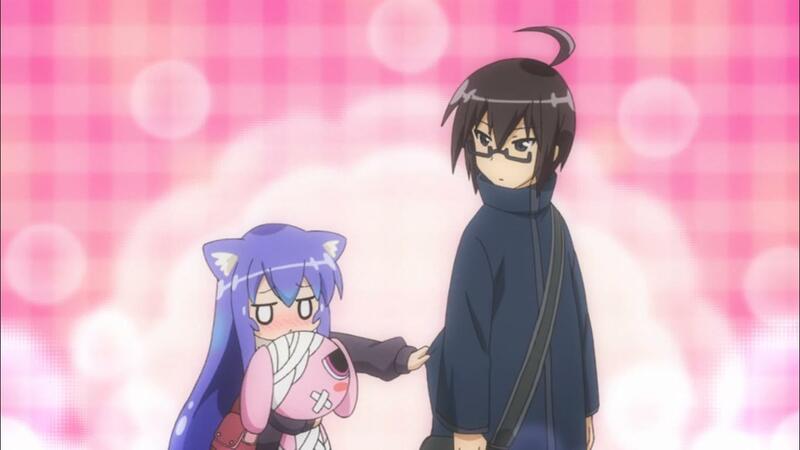 In truth Place to Place is a comedy; pure comedy disguising itself as a romantic comedy by sprinkling in a few moments of cuteness and Io’s unintentional raising of Tsumiki’s affection. The real meat of the series is watching the main characters and secondary cast get themselves into perfectly mundane shenanigans made completely over the top by their seemingly super-human talents or weird ideas. For example the cast talk about Io in a server uniform looking like a bartender, serving cocktails based off wrestling puns. Actually, there are wrestling moves in a lot of gags. Tsumiki’s romantic failures are meant to evoke laughter, removing most of the underlining drama found in most romantic comedies. I find it fortunate that the cast likes to put their own spin on most situations that would otherwise be a very tired ‘been there done that’, for example during a school festival, Mayoi had Io and Sakaki dress up as hosts (men who keep women company, flirting with, and humoring them, but do not go beyond that) and charm them while cooking crepes for them, in typical Io-fashion, the girls end up “full” before they even eat their crepes. Last time I saw a game of kick the can get this intense was… Never, actually. All the characters came from a 4-koma so it comes to little surprise that when you have to draw several characters per square, per page, they get simplified to the point they all more less have the same facial structure; though Ishiki did a good job with their hair, expressions, heights and their mannerisms to make them distinctive enough from each other to easily differentiate them all. Pros: The show is very cute when it focuses on Tsumiki, or cats, or Tsumiki acting like a cat. The animation is pretty even throughout and was never off model as far as memory serves. 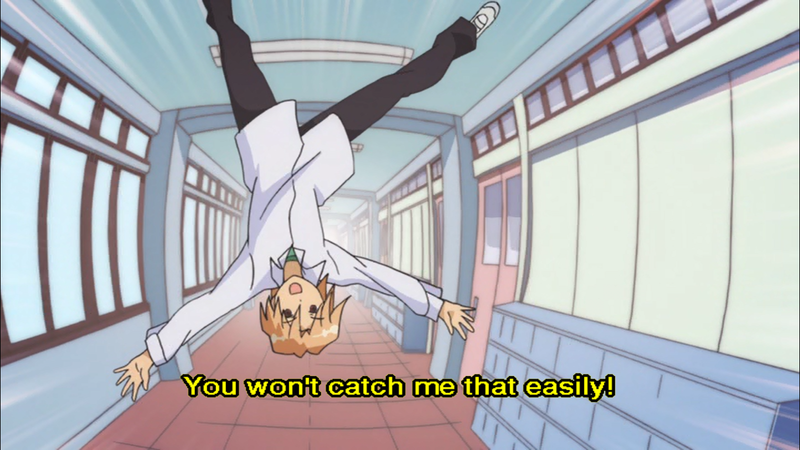 Gags are quite varied so the show doesn’t wear itself off. Cons: Music is a tad weak, it simply wasn’t made to stand out. The opening and credit songs are a bit of a step above, but I still would not buy discs for either of them. Some of the subtitle translations feel a little iffy, but suffice. No romance to speak off, unless you count Io charming women left and right. Place to Place is not out to break the mold of 4-koma adaptations, but it doesn’t have to, what it does, it does excellently. Sentai Filmworks released the dvd version of Place to Place, and I should think it is well-deserving of your attention.